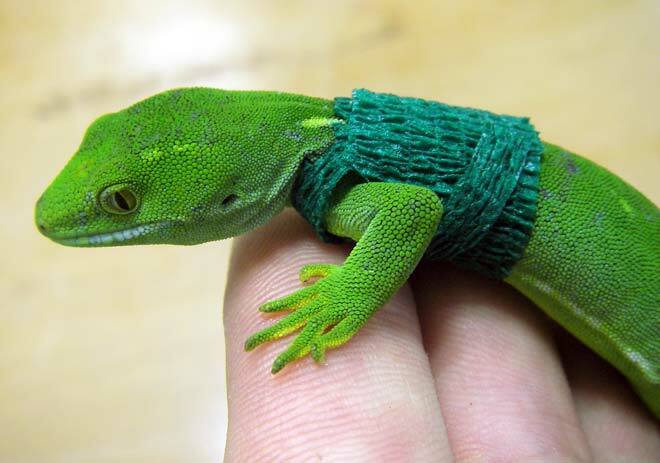 This green gecko (Naultinus elegans punctatus) has a tiny transmitter attached inside its polyester and latex jacket. The transmitters were part of a research programme on Matiu (Somes Island) in 2007. The movements of two tagged geckos were to be monitored once they were reintroduced to the island sanctuary. Researchers wanted to find out the geckos’ likely movements before reintroducing 30 more over the next two years.